Another hot sunny day, the trail warmed its stones from the cold night. A short hike uphill showed us the other side of the summit (4000m). 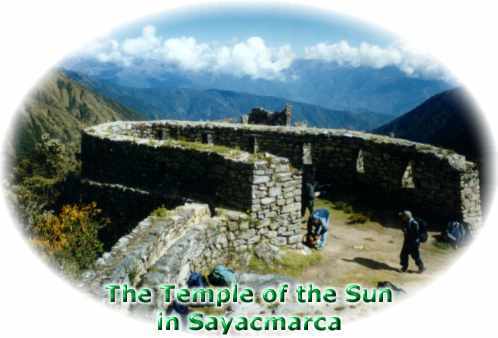 About one kilometer along the rising trail was the ruin of Sayacmarca visible, Quechua for 'Dominant Town'. Two beautiful green lakes are seen along the way. 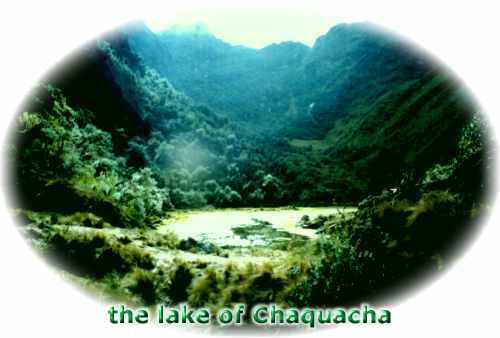 The biggest lake, Chaquacha, feeds the smaller one by an underground river. Subtropical forest was all around us. High in the deep green trees grew colorful orchids. Humming birds and butterflies flew around us. After descending 300m we reached Sayacmarca, constructed at a small summit. This was the biggest ruin we had seen so far. 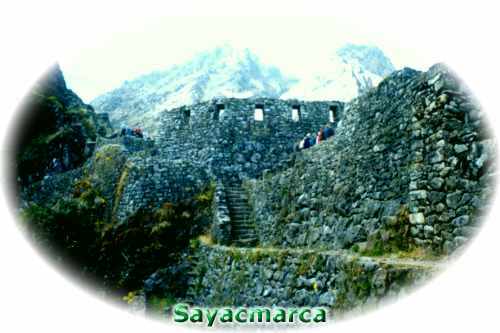 With has only one entrance, a stairway up to the small city, Sayacmarca is called a fortress. There are two parts, a temple of the Sun (a solar observation post) and a residential half. A little river was bridged into the city and an ingenious system of canalization brought the precious water to all parts of the ruin. These canals serve more than half of the houses. The water finally fills ceremonial baths and disappearing in the jungle. The ruin was originally build by the Colla, the biggest enemy of the Incas before they became kings of the Peruvian highlands. The Incas improved the site that had only one weakness: there is not room for agriculture. A small ruin next to Sayacmarca functioned as the farm of this small city where only 200 people could live. But again, this spot was perfect because of its strategy and inside people and religion can live in perfect harmony. The only frailty was food in case of a military occupation. So several big rooms of Sayacmarca must have been reserved as a warehouse. None of the guides I listened to ever mentioned this. The Inca Trail continues along beautiful forests and rolling rivers. The farmhouse can be seen and visited where the local keeper lives now. What a romantic place to live. Camping in the ruins is not allowed since the mid 80's. Some hikers managed to make a fire inside of the temple and damaged the walls severely. There is a small campsite next to the farm. 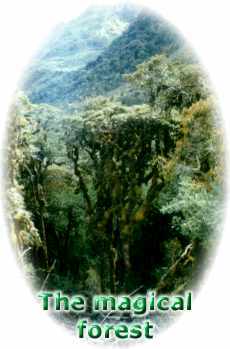 The trail crosses the 3600m high Aobamba River ('wavy plain') and climbs gently up to 3700m. We crossed the wonderful cloud forest full of flowers and birds. We could see the gently mountain Salcantay again. The Incas constructed some tunnels that are a caress for the eye, perfectly matched into the natural environment. At the highest point the Urubamba River could be seen. Soon we arrived at our next camping spot, at an altitude of 3750m with view over the ruin of Phuyupatamarca or 'town above the clouds' and the mountain of Machu Picchu. The sanctuary was still not visible. Strangely enough, it's actually not scary walking on the Inca Trail, even though it looks a bit iffy in photos and there are many times that the trail is on the edge of some steep drop-offs. There are always porters passing the hikers, literally running up the trail, and it's a good idea to move to the mountain side of the trail and let the porters pass on the cliff side. Just about the only time I remember being seriously nervous - i.e. I bent down and climbed with my hands as well as my feet - was for a few steps on the staircase ascending to Sayacmarca...there's one spot where the rock wall bulges out above the stairs. And this staircase is actually a branch off of the trail - you can continue on the trail and skip Sayacmarca if you like. I get a bit skittish if I have to walk along very narrow paths with a very STEEP straight drop off. Most pictures don't look too bad. How bad is it, i.e. is it very intimidating or is it not as bad as I hear. Note: I've climbed Kilimajaro without a problem.